Successfully Added Dual Band Cellphone - Leatherwork Casing With Dragon Design to your Shopping Cart. 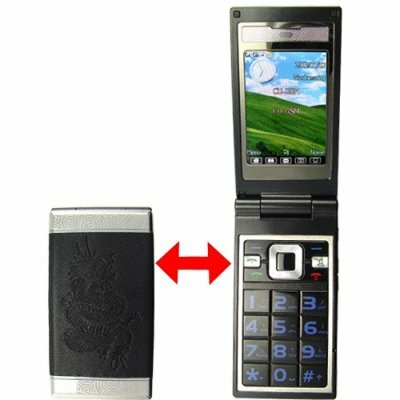 Designer style two band mobile phone (900MHz, 1800MHz) with embossed dragon carving on black leather. This hot dragon cellphone has dual SIM with dual standby, 2.5 inch touchscreen QVGA LCD display, GSM with 2-bands, and a keypad with extra large keys as its signature features. Want to get a new easy to use touchscreen cellphone that has style and rich multimedia features, but have a tight budget? No worries here! This new cellphone includes everything you usually see in phones twice this price, and then even includes more great features like Bluetooth with A2DP + AVRCP, WAP, FM radio, and wonderful software tools with touch screen friendly icon menus to give you maximum ease of use. And on top of all that, this budget friendly mobilephone has nice size profile (101mm x 52mm x 20mm) and a hot dragon design. You owe it to yourself to order a sample today and see how good it is for yourself. After that, you can order in a larger quantity to feature in your online/offline store. Your customers will thank you for featuring this great phone in your store. Brought to you exclusively from your direct from China wholesale source, Chinavasion Electronics. Modern touch screen cell phone with rich multi media features and hot dragon style. Features an advanced Bluetooth software set including A2DP + AVRCP functions. Media friendly cellphone with big button keypad for easy use. NOTE: This product is compatible with GSM at the frequencies of 900MHz, 1800MHz. Please check with your local provider if you are unsure of your local band requirement.